Starred Review. 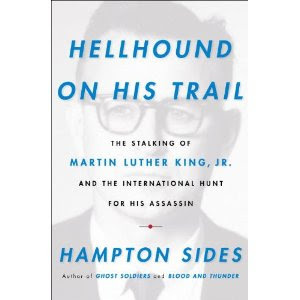 The counterpoint between two driven men—one by a quest for justice, the other by an atavistic hatred—propels this engrossing study of the King assassination. Sides, author of the bestselling Ghost Solders, shows us a King all but consumed by the flagging civil rights movement in 1968 and burdened by presentiments of death. Pursuing him is escaped convict James Earl Ray, whose feckless life finds a belated, desperate purpose, perhaps stimulated by George Wallace's presidential campaign, in killing the civil rights leader. A third main character is the FBI, which turns on a dime from its long-standing harassment of King to a massive investigation into his murder; in Sides's telling, the Bureau's transoceanic hunt for Ray is one of history's great police procedurals. Sides's novelistic treatment registers Ray as a man so nondescript his own sister could barely remember him (the author refers to him by his shifting aliases to emphasize the shallowness of his identity). The result is a tragedy more compelling than the grandest conspiracy theory: the most significant of lives cut short by the hollowest of men. "...(the author refers to him by his shifting aliases to emphasize the shallowness of his identity.)" Are you kidding? Shallowness of his identity? Where do these lone nut, pro-official story nutcases come up with these ridiculous phrases? Don't you think he just might be using an aliases because he's an escaped convict accused of murder? What an idiot! It's really misdirection. He wants to steer you away from the mystery of the Canadian aliases Ray used because they are the key to the fact that he had help, that he was given the names of real men, that there was a conspiracy. This book by the late great Prof. Phil Melanson, though out of print, is arguably the best book to use to start researching this case.